Mega Star Brad Pitt made a guest appearance on Jon Stewart’s The Daily Show this past Wednesday where he made a point to condemn the traditional gas-guzzler with an analogy of his new Academy Award-nominated Moneyball. Not only are we more mobile, this mobility is far more egalitarian than mass transportation was in its heyday. Well over 90 percent of American families have at least one car, and many of those who don’t could own one but choose not to. Some new cars cost more than $100,000 while some used cars cost less than $1,000, but they all have more-or-less equal access to nearly all America’s highways, roads, and streets. The biggest benefit is increased incomes. The incredible mobility provided by the mass-produced automobile has significantly boosted personal incomes in the past century. We typically think people buy more cars only when they can afford to do so, but the reality is more complex. Incomes are increased by auto ownership as much as if not more than ownership is increased by higher incomes. Regardless of the automobile’s inability to meet the standards of the Hollywood glitterati, it has freed the average person from geographic and economic isolation. 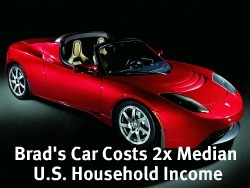 Brad, who makes millions per film, has had the luxury to be one of the first of the Hollywood royalty to own a $100,000+ electric Tesla Roadster that was released in 2010. I have no hard feelings towards Brad’s personal automobile predilections, so he should keep his contempt for the car that I drive to himself. To view Brad’s performance, click here and fast-forward to the 2 minute mark to get directly to the analogy. Brad is a first rate actor. I really enjoy the films he has made. He is also a man of great individual compassion. He earns my respect for this. In the interview, however, he acknowledges that he did not understand the algorithm used that was the basis of the movie “Moneyball”. This is a very telling comment. He proves that anyone can pretend to understand something they really don’t. The automotive industry provides both high mileage and alternative drive train vehicles. It is not a lack of vision on behalf of car makers, as Brad implies, that fuels the market for the internal combustion engine (pardon the pun). Economics, plain and simple, drives that market. The overwhelming majority of people buy the least expensive vehicle that meets their needs. Why? Because they feel they can use the remainder of their money in a better fashion. If that turns out to be a vehicle powered by an internal combustion engine, who are we to second guess their decision? There is a reason people in the automotive and fossil fuel industries do not tell Brad how to act. He is simply so much better trained in the field of acting. Likewise, he should keep his emotional comments to himself about fields in which he has no training. It may make him feel good, not to mention being politically correct, to slam the car and oil industries. But it reveals how shallow his thinking is on this subject and these industries. If you drive average 12000 miles per year at 22 miles per gallon you are spending $2000 per year in gas @ $3.5 per gallon. You need to account for oil and other maintenance. Thats additional cost of ownership for gas cars. On the other hand electric cars require no maintenance and price of electricity is almost negligible. Thing is we have had the technology to produce electric cars since forever and we have been making them even in seventies. Watch movie “who killed electric car” its free on youtube. The only reason we dont drive electric cars today is because of oil industry. “On the other hand electric cars require no maintenance and price of electricity is almost negligible.” What planet do you live on? Why would the maintenance costs for electric cars be less? And where the hell are electricity prices almost negligible? FOSSIL FUELS ARE BURNED TO MAKE ELECTRICITY! Ignorance is bliss, eh? It would seem as if you’ve missed Brad’s point entirely. Given the technology available today, would we create a vehicle like the petroleum fueled car? The answer is clearly no. Your point about the car is orthogonal to the central issue. Erase 100+ years of infrastructure and think about how we would not move forward on personal transportation technology. We would use anything available in infinite quantities, harvested anywhere, and clean: electricity, hydrogen, biofuels, etc. Car companies around the planet are betting the bank on alternative fuels: Nissan/Renault with the Leaf, GM with the Volt, Ford with the Focus EV, the Smart EV, Tesla, Peugeot, Toyota, Honda, BMW i series, and more are all shifting toward electric, hybrid electric or biofuels. You are living in a dream world. People don’t buy electric cars because they are incredibly expensive, have poor range, and take too long to charge. The Chevy Volt is $41,000. I could buy a nearly brand new Chevy Cobalt for $15000. It gets 36 MPG. There’s no comparison. And there’s no vast anti-electric car conspiracy. If people thought electric cars were worth the money, they would buy one. But they aren’t worth the money. Period.